Eating, vaping, smoking, applying topically; these are just a few of the ways that people can ingest cannabis, better known as marijuana. But, which is the most beneficial way to consume this multi-faceted hemp plant? This article seeks to uncover some of the ways that cannabis can be used, and the benefits these methods provide users. Medical professionals are increasingly touting the benefits of cannabis, which has been shown to help with everything from sleep and pain, to anxiety and nausea. Cannabidiol (CBD) oil, a cannabis plant derivative, which is low in THC and high in CBD, offers relief for these types of medical conditions, without any of the psychoactive side-effects. Products like vaping pens discreetly allow users to ingest pre-measured doses of cannabis concentrates, often butane hash oil (BHO) or distillate, without the harmful effects of smoking the cannabis plant. Cannabis smoke is filled with some of the same chemicals as tobacco, including ammonia, hydrogen cyanide, and formaldehyde, which are cancer causing carcinogens. However, there is no evidence that smoking cannabis leads to lung cancer, unlike cigarettes. THC capsules, known as cannacaps, also provide a safer alternative to smoking cannabis, because like vaping pens, the doses are pre-measured. Cannacaps can be used to treat a number of ailments, like sleep. The primary benefit of using cannacaps is the duration of THC’s effects. Cannabis oil sprays are beneficial alternatives, because they can be delivered orally, usually sublingually; providing a fast-acting dose of CBD. Sprays contain different ratios of THC and CBD and a variety of flavors so they can be used for recreational or medical purposes. These sprays come in a variety of strengths and have been known to benefit some asthmatics, who are unable to inhale cannabis for the necessary medical effects. Other cannabis products such as drinks infused with cannabis provides users with much needed relief from ailments, and drinks like tea can be produced with or without the THC psychoactive component. THC and CBD topical creams are also being used for pain management. These topical ointments and creams are gaining in popularity among older users, because of the medicinal effects for relieving pain without any of the psychoactive effects. Cannabutter is a key ingredient found in many edible cannabis recipes. Cannabutter offers an easy and tasty way to ingest cannabis properties like THC and CBD, without the harmful effects of smoking. Cannabutter should always be kept refrigerated. If, edibles, vaping, or smoking do not meet your needs, there is always soaking. Soaking in bath salts laced with THC offers users a great way to relax and soothe aching muscles and joints, without any of the psychoactive effects. 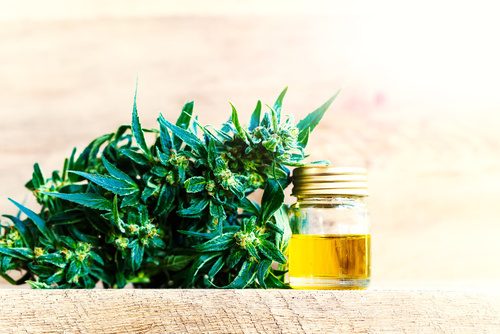 According to medical researchers, CBD does produce significant changes in the body, and some researchers have gone on to suggest that CBD has definite health medical benefits. CBD produces effects in the body by attaching to certain receptors. The body produces certain cannabinoids naturally, and also has two receptors called the CB1 and CB2 receptors. CB1 receptors are present throughout the body. The brain’s CB1 receptors control coordination, movement, pain, emotions, mood, thinking, even appetite and memories. CB2 receptors are more focused on the immune system, also affecting inflammation and pain. However, current studies show that CBD does not directly attach to CB1 and CB2 receptors when introduced to the body. Rather, the body appears to use more of its own cannabinoids.